More than a dozen people were injured at a high school in Indiana when a stage collapsed in the middle of a musical performance. Students from Westfield High School in Westfield were performing ‘American Pie’, a musical tribute to rock and roll, when the stage gave way during the finale late Thursday. 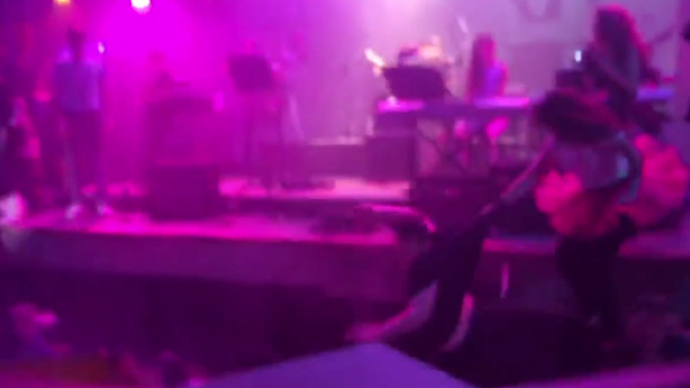 Video footage from the school auditorium show that more than two-dozen students were dancing on the stage to the Journey song ‘Don’t Stop Believing’ when the collapse occurred. "Some parents rushed the stage area," audience member Mandi McKinley Brown told the Indy Star. "Most of us stayed in our seats to stay out of the way. People were lifting large pieces of the stage out of the pit from on top of the kids." "I saw that people's feet were stuck under a lot of wood and I lifted a lot of wood off of a lot of people," eyewitness Charile Fehr told a local ABC News affiliate. A total of 13 patients were treated for injuries sustained during the incident, NBC News reported, and a spokesperson with the Westfield Police Department told WTHR News that a student originally listed as being in critical condition was “doing fine” as of Friday morning. Andy Cook, the mayor of the Indianapolis suburb, held a press conference on Friday morning and said that he had visited area hospitals overnight to visit the injured students. “The students and teachers will talk through this, work through this,” said Westfield school Superintendent Mark Keen. St. Vincent Health, a regional hospital system, said that eight of the patients they treated were minors and that five were over the age of 18. Classes at Westfield High were scheduled to resume as normal on Friday, and educators and authorities say they are investigating the cause of the stage collapse.